Logo 1 indicates that the electronic information product does not contain any toxic or hazardous substances or elements, and is green and environmental. It also signifies that the product can be recycled after being discarded, and should not be casually discarded. Logo 2 indicates that the product contains certain toxic or hazardous substances or elements, and can be used safely during its environmental protection use period. 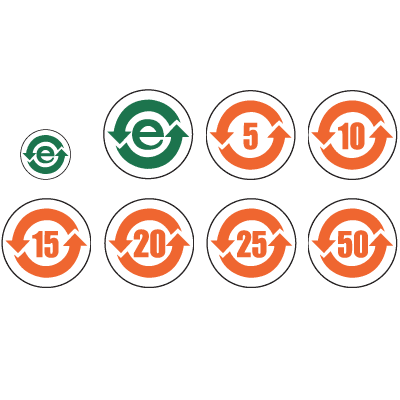 The number in the middle of the logo indicates the environmental protection use period (# of years) for the electronic information product. The logo also signifies that the product should be recycled immediately after its environmental protection use period has expired.